Simply Sweet Watermelon Salad is super delicious. I never knew that watermelon could possibly taste this good. In fact, I never thought that watermelon salad even existed until recently. I overheard two ladies discussing watermelon salad while I was standing in line at the check-out. I guess I was eavesdropping but what the heck, I’m only human and really quite intrigued with this “new to me” watermelon salad. Instead of buying ingredients to make watermelon salad, I decided to make do with what I had. 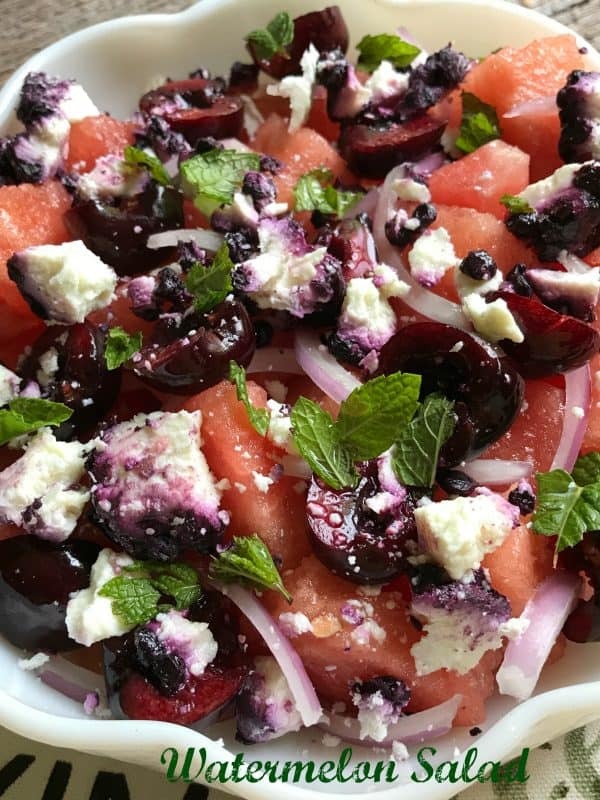 What I did have was watermelon, sweet black cherries, red onion, blueberry vanilla goat cheese, fresh mint leaves, bottled lime juice and honey. I decided to give it a go and started to make my version of watermelon salad. I recently purchased the blueberry vanilla goat cheese while attending the WI State Fair, so I was anxious to try it. 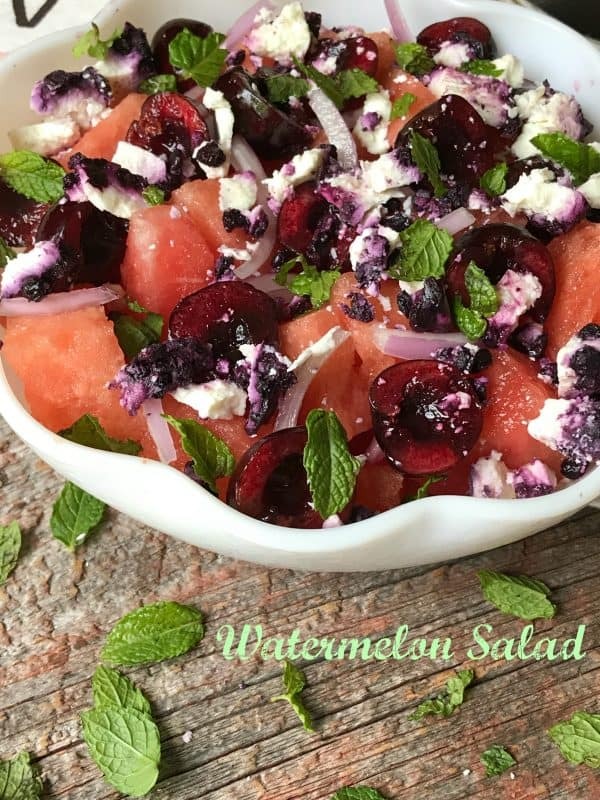 Simply sweet watermelon salad is a must try. It’s fast, easy and simple to make. 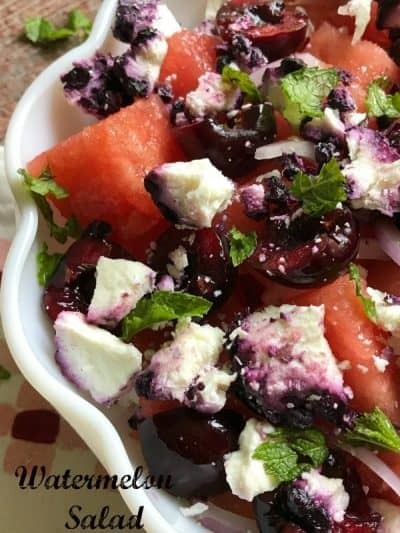 The refreshing taste of the sweet watermelon, combined with the juicy cherries and tangy blueberry flavor from the goat cheese is super by itself but drizzle on the lime/honey dressing and you have a winner. The torn mint leaves add that coolness you’d expect from fresh mint. *In this recipe we used Nellie and Joe’s Key Lime Juice and Montchevre Blueberry Vanilla Goat Cheese. Both products are a must try. If you can purchase these products in your area, please do! Nellie and Joe’s Key Lime Juice is the next best thing to “real” lime juice. If you live in an area like I do, where fresh key limes are seasonal, then you need to keep a bottle of key lime juice in your refrigerator. Montchevre Blueberry Vanilla Goat Cheese is absolutely heavenly delicious. It’s smooth, creamy, and tangy with suburb blueberry flavor. I can’t say enough about this product, it’s that delicious. I also purchased Fig and Olive and I can’t wait to try it. 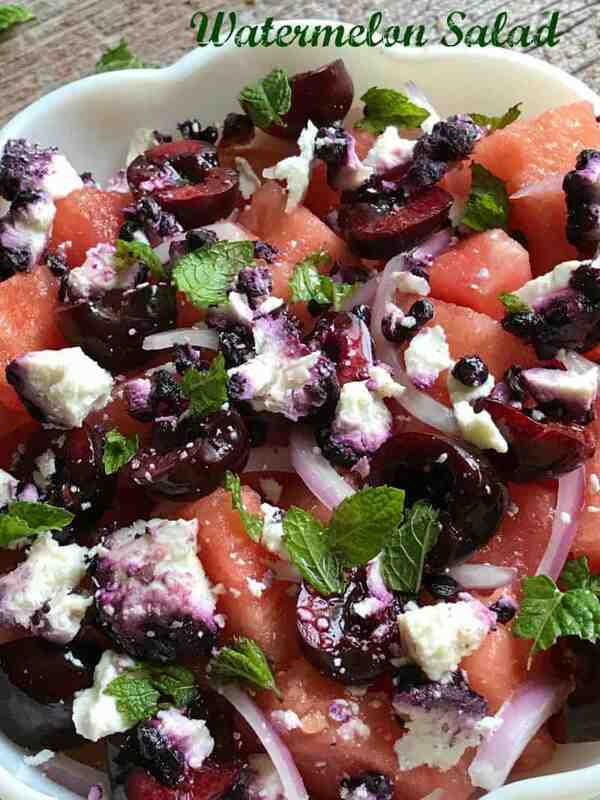 A fantastic salad made with watermelon, red onion, sweet cherries, blueberry vanilla goat cheese and fresh mint. 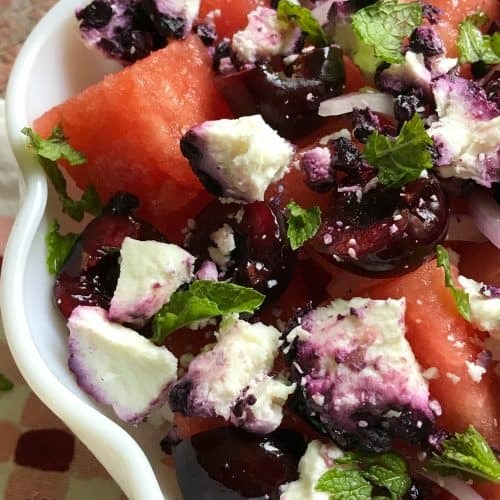 Watermelon salad is lightly tossed with key lime juice and honey. Fantastic. Stir to together lime juice and honey until combined, set aside. 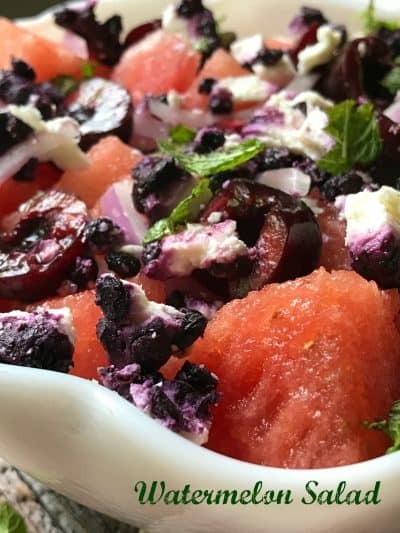 In a large bowl combine watermelon, red onion, and black cherries. Gently toss together. Add crumbled goat cheese and torn mint leaves. Drizzle lime/honey dressing over the fruit, serve immediately. Looking for more Lime or Goat Cheese Recipes? Here are a few of our favorites. Lime Garlic Shrimp with Mango Mint Salsa, Key Lime Fruit Dip with Fruit Kabobs, and Frozen Mini Key Lime Pies. Recipes that showcase the tangy flavor of goat cheese: Bacon and Honey Goat Cheese Crostini, Sweet Potato Goat Cheese Cranberry Rounds.